Originally paid around $300 for this receiver. I have it paired with 4 Paradigm speakers (2 bookshelf in bedroom 2 floor standing in leaving room) For the price, the sound is excellent. This receiver is now 20+ years old, and I still enjoy listening to it. It Is work connected to the TV? Basic coherence, unforced exciting sound. Honestly, if your a first time buyer you might not realize how good it is till you hear all sorts of other budget gear or even hifi integrateds. An amp made for muisc, not hifi. cluttered front panel, slightly loose feeling volume control, not very cool looking - but who cares? A very cohesive,clean and exciting kind of sound. This is a reciever for those who like their music but hate over sophisticated, expensive, 'tinkly' sounding hifi equipment. It has plenty of power and its fast bass, engaging uppper mid freq. and good depth are especially good for rock but its clean and natural tone makes all music sound right. In short it just lets the music do it + it has a great phono stage and more than competent tuner. Well made, lay out is easy to navigate the controls. Great Value for the money, especial on the 2ndary market if you can get one. I bought this to replace a cheap Sony 40W reciever that I used, abused, and destroyed in college trying to power my KEF Q90 speakers. (My KEF Q90''''s won some hellraising on-campus dorm wars but that''''s a different review ;) After college I bought this unit because it was the most powerful Denon non-AV reciever available. I live in an apartment and not a house. So home theater is Over Kill for me. I have student loans to pay and can''''t afford to by real home theater eq. I wanted to stay with a strict audio product. I am very happy with the 375. I got all the power need with out all of the uneeded extras. My KEF Q90''''s breathe alot easier with the extra power. I agree with other reviewers the remote is poorly designed but well made. I have to constantly look at it to make sure I don''''t press the wrong button. I reccomend (sp?) this model to anyone who is looking for a straight Audio reciever with enought "umph" to power a pair of 3 way floor speakers. I listen to everthing from AC/DC to Motzart to Ice Cube to Billy Joel. The 375 does a great job for what it''''s designed for. My current set up: Denon DRA-375 Denon DCD-820 CD payer (very old) Nakamichi CR-3A tapedeck(my pride and joy) Speakers: KEF Q90''''s. I plan to upgrade the CD to a NAD 541 this week. I just wanted to put my two cents in and say that I agree whole-heartedly with what George from Takoma Park had to say. I used to work at Tweeter and own the previous model Denon receiver (the DRA-545). It seemed that everyone on the sales floor would avoid using the Denons to demo speakers because Denon receivers were so harsh in the high end (until you got into to more expensive models). The 545 was the model that was replaced by the 375. The 545 was SO much better. I was always amazed at how much lighter and tinny-sounding the new Denons were. Someone needs to force them to make recievers based on the old spec! This unit is a powerhouse in disguise. It handles bass, mid and high ranges with great facility. It makes me want to get new speakers. While this is mid-priced unit $300.00, feel out the refurbished market and eBay for less expensive deals. This unit is simple, easy to use and great to listen to. I'd recommend this unit to anyone looking for a quality receiver. If you feel the need to spend more money you could always but this unit and give the extra money to your local "child-crisis center." I sold my Denon DRA-345R to make room for this one. The DRA-375 is simply meets my listening needs better. First off, I've owned a Denon PMA-730 integrated amp since the early 80's. Built like a tank but what a nice sound it has. It's a BIG unit for what it is and barely fits into the cabinet I have. After 17 years I decided to buy a reciever to save some weight and space. 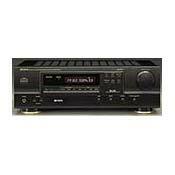 I also decided to stay with Denon because my tuner and tape deck are also Denon and I like what I hear. I chose the DRA-375 on price, power needs and the reviews I've read here. I bought it from Tweeter over the net because they had a good price and they deliver, FAST! OK, I have it hooked up and powered. I notice that the source selection display is a bit confusing. There's a main display for things like tuner, phono, CD and so on. For tape input, there's a secondary display while the main display is still lit. For example, if you switch from phono to tape, phono is still lit in large letters while the word "tape" appears elsewhere in much smaller letters. Disconcerting at best.I get it straightened out eventually. Well, I've got a pair of Genesis 10 speakers, old but so good, and these have tweeters that are unforgiving to anything mediocre upstream. The more I listen to familiar music, the more I become aware that the highs just sound harsh to my ears. After about three weeks of this I've had enough and send the thing back to Tweeter. I hook up my old amp again and, ahhh..., that's more like it. Sorry, folks but I'm putting this reciever down. I just get the feeling that Denon is cutting too many corners these days and their quality isn't what it once was. Perhaps their high end gear is still good but the mid-level, "consumer grade", gear doesn't seem worth it. I have it for more than 3 months. I got it refurbished for 130$. It sounds really great considering the price. Really musical receiver. To bad it does not have subwoofer out but I won't buy sub anyway. I got enough bass from my KEF Q15 speakers. I don't regret buying it. I did not compare with other models though. RDS is really nice but none of Christion stations support it, so there is no benefit for me. No major flaws except that I can't adjust volume very precisely using remote. Remote is not super but it pretty good. I don't keep anything on top of it so cooling is better and receiver won't die due to overheating. Not the highest grade staff, but for price it rocks and I doubt that anybody can get better system for the price (600$). This is the best product that I have auditioned, especially when figuring the price differences. Keep in mind that I have done extensive a-b comparisons with each of the listed products in my home. I gave each product at least 70-100 burn-ins before comapring sound qualities and every time I picked the denon overall!!! Some of the other reviewers on this receiver have said that it sounded harsh and it does sound horrible up until 70 to 150 hrs. and then it is perfect!!!! Please allow proper burn-in before getting to critical about the sound of this receiver, you will be glad you did it's that good!!!!!!!!! Strongly Recommended!!!!!!! I love this receiver. Clean, clear, crisp sound that doesn't get fatiguing. I just want to listen and listen. This definitely rivals lower powered/priced integrated amps for sound quality. In my system this receiver is partnered with an H/K 8370 CD player with HDCD decoding, and Mission 701 bookshelf speakers via AudioQuest Type 4 speaker cables. With HDCD discs the sound is absolutely great, it just sings! I purchased all the electronics mentioned here at uBid for less than $500 total. There's simply no excuse for living with cheapo, junky sound at these types of prices. Denon pairs its minisystems with Mission speakers, so I set up my system this way, and there is something magical about the combo. I have tried other speakers with the Denon — Wharfedale Diamond 7.1, PSB Alpha Minis — and while both were still quite good, they just don't match the Missions. For anyone looking to hear true quality sound at a reasonable price, I recommend the Denon 375 highly.